Designed to harmonize liturgies throughout Easter, One with the Risen Lord is a blessing for all who observe and prepare music for this holy season. The 17 songs in the One with the Risen Lord CD offer music for the entire Easter season, from the Vigil to Pentecost. The One with the Risen Lord MP3 Album offers the 17 songs for the entire Easter season, from the Vigil to Pentecost. Designed to harmonize liturgies throughout Easter, the choral songbook is a helpful tool for all who observe and prepare music for this holy season of Easter. 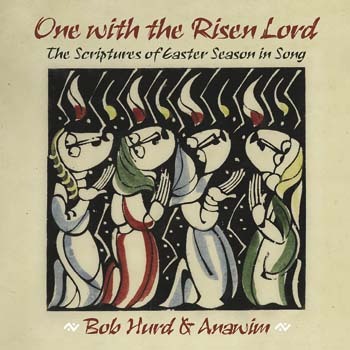 Offering a total of 17 songs, this collection from Bob Hurd and Anawim provides music for the entire Easter season, from the Vigil to Pentecost. In many ways, it does for Easter what A Lenten Journey does for Lent. Together, these two collections enable music directors to prepare the 90 days of Lent and Easter as one great feast. Bob understands the power of music to draw worshipers more deeply into the readings, prayers and rites of the Mass. In creating this new collection, he looked carefully at the readings for the Sundays of the Easter season, coming up with songs that reflect and echo these readings. Out of his meditations came songs -- reverent, beautifully crafted new songs that reiterate specific themes in those Scriptures. Though many of these are intended as Communion songs, they are equally appropriate for preparation of the gifts and the song of praise after Communion. Echoing and responding to the second Sunday's doubting Thomas story, "Though Not Seeing You" expresses gratitude to Christ for his unseen presence in our lives. A strong new work for Ascension, "I, the Lord, Am with You Always" reminds us that the Church is now the body through which the risen Lord carries out his mission. Marked by gorgeous harmonies, "Filled with the Spirit" is an energetic, gospel-style song for Pentecost. In addition to songs specific to each Sunday's readings, One with the Risen Lord also provides general seasonal music, including the common responsorial psalms and a Gospel acclamation with verses for each Sunday. The seasonal themes of light and peace are reflected beautifully in "Litany of Peace" and "'Ke Bona Leseli/I Have Seen the Light," both by Barbara Bridge, long-time collaborator with Bob and member of Anawim. Featuring a meditative refrain inspired by the prayer of St. Francis, the litany is well suited for intercessions, preparation of the gifts and Communion. The music of One with the Risen Lord is more than a just a celebration of the resurrection -- it is an invitation to union with the risen Christ. Designed to harmonize liturgies throughout Easter, and available physically as a CD and choral songbook and digitally as an MP3 playlist, it is a blessing for all who observe and prepare music for this holy season.